Is it too late to plant fall vegetables? Not at all—even if you're way up north. Do you need to start the seeds in containers and then transplant the seedlings into the garden? Nope. Do you need a greenhouse to successfully grow fall crops? No again. What about a cold frame? Not necessary, though they are really handy, and someday I'll get my hunky farmguy Joe to build me a cute Amish cold frame like this one—or four. Are those pests you've been battling all summer going to show back up and attack your crops? I doubt it. What about the weeds? Not a problem with my simple seeding technique. Is this all sounding too good to be true? Yes, but it's not. I'm amazed at how much food I've grown over the years during the months from September to December—and we live in zone 5, with an official October 15th first frost date that often arrives earlier. 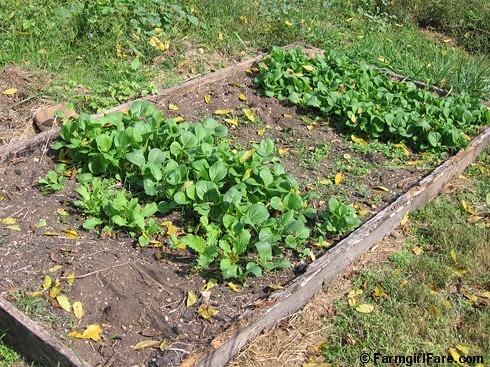 What's the key to a successful, low maintenance fall vegetable garden? Choosing cool season, cold tolerant plants that mature quickly. 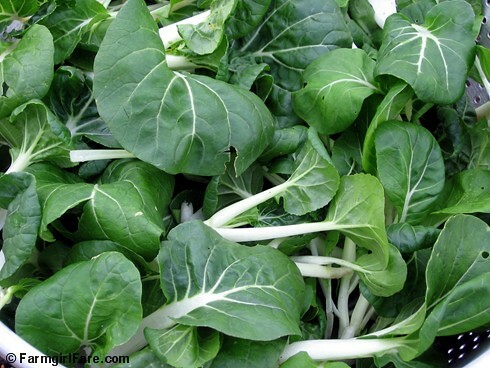 Asian—also called Oriental—greens are a great place to start, especially since many of them can be eaten very young. Adorable baby bok choy, anyone? And if they start growing out of control and you're feeling overwhelmed, just pull out the wok (I love our cast iron wok) and stir-fry several pounds of bounty into dinner. It's amazing how much cooked greens reduce down. And they're also really nutritious. On Saturday the 11th (a fertile day in the first quarter for those of you minding the moonsigns), I sowed eight kinds of heirloom Asian greens in one of my 4'x8' raised garden beds. Pulling out all the weeds, pulling out some of the rocks (I'm never going to get them all out of there, especially since I think I keep putting them back in), smoothing out the soil, scattering the seeds, and then covering up and watering them all took under an hour. This was the bed where I grew my late planted garlic this year, so it already had lots of aged sheep manure in it. If your soil isn't very fertile, dig in some compost or well rotted manure before planting. If I'd thought about it, I would have mixed a little kelp meal (which we buy in 50 pound bags and feed to the animals) and some gypsum (which is calcium sulfate, one of the things we use to organically fertilize our fields) into the soil. 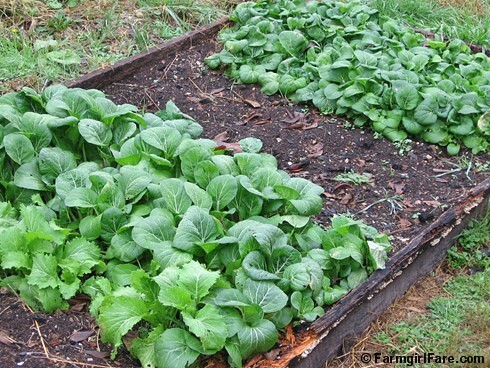 You can read more about using gypsum as a soil amendment in the garden here. The trick to easy planting is to stop sowing your seeds in neat little rows and scatter them thickly in large swaths or squares instead. It's easier, faster, and will give you more food and a lot fewer weeds. This is how I started growing all my lettuce several years ago, and it worked so well that I now use this technique for growing everything from arugula to Swiss chard. If you don't have any seeds leftover from spring and can't find any nice ones for sale locally, you still have time to mail order some. Seed companies aren't busy this time of year, and turnaround is usually very quick. I went through my still rather enormous seed stash (despite that whittling down I did a while back) and grabbed all the packets of Asian greens I had. Since I never got around to ordering any seeds this year (nothing like having the flu for four months! ), they were packed for 2008 and 2009. This means some may have a low germination rate, or they may not sprout at all. But since it's already the middle of September, I didn't feel like taking several days to properly test my seeds, so I just sowed them thickly instead. If they don't sprout it's no big deal, and if they come in too thick, I'll simply start thinning sooner than I normally would. There are all sorts of varieties of Asian greens seeds available, and it's fun to experiment growing and tasting different types. My eight packets of seeds cost me $13.75, so even if I only harvest a few heads of pak choy out of all this, it'll still be time well spent and a delicious deal. I also have a packet of Canton Bok Pak Choy seeds packed for 2009—which as you can see from the photo above, I know I've grown before—that I'm hoping to sow somewhere else since this bed was getting crowded. Too lazy to take a notebook out to the garden with me, I (finally) had the brilliant idea to simply plant the seeds in alphabetical order across the bed, so there was no need to keep the packets in order or try to remember what went where. I divided the bed into eight 4'x1' sections. Dragging my hoe through the soil to mark the rows made indentations I didn't want, so I marked the rows at the edge of the bed with rocks and then smoothed the soil back out. If I'd been thinking, I would have sprinkled little lines of flour along each line instead—one of the many tricks I learned from my favorite gardening book, The Vegetable Gardener's Bible, which has an updated 10th anniversary edition available. I scattered the seeds as evenly as I could in each section, which is a little difficult since they're tiny and almost all as dark as the soil. Then I covered them up. One of the biggest mistakes gardeners make is planting their seeds too deep. Most seeds need 1/4" or less of soil covering them, and some don't need any at all (these actually require light to germinate). Better to plant your seeds too shallow than too deep, because they won't have the energy to poke all the way out. To cover the seeds, I took two 5-gallon buckets of compost and used a shovel to lightly scatter a thin layer over the entire bed. It doesn't have to be perfectly even, and if your compost is the same color as your soil, it can be a difficult to see how good of a job you're doing. My compost always has little pieces of eggshells in it, which I used to find annoying until I realized it was actually helpful in times like this. 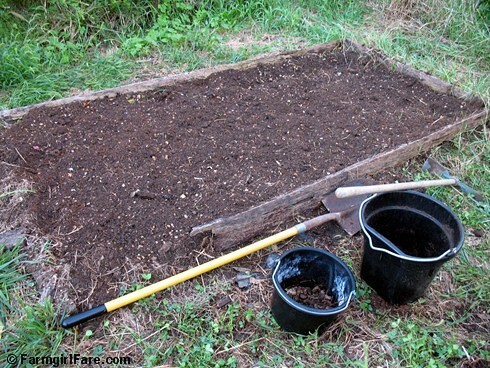 If you don't have enough compost, just use some garden soil dug out of that bed (before you scattered the seeds) or from another area of the garden. You can tamp down the soil to ensure good seed to soil contact, using a large hoe or some other flat object, but this is a tedious process when you're talking about 32 square feet, and I often skip it. You do want to be sure and water the soil well. Be gentle, or you'll wash away all your work. I use 2-gallon plastic watering cans with a sprinkle spout or my garden hose sprayer attachment, which gives off a slightly more powerful version of the watering can sprinkle. Floating row covers are handy in spring, fall, and whenever cute critters are around. When I was done, I laid a piece of floating row cover (sometimes called by a popular brand name, Reemay) on the bed to protect it from the curious cats and digging dogs, which was a good thing since I found a few paw prints sunk into the soil the next morning. The nice thing about direct seeding fall crops is that the soil is already good and warm, and that means faster germination. Some of the seeds I sowed on Saturday have already sprouted, and it hasn't even been 72 hours. 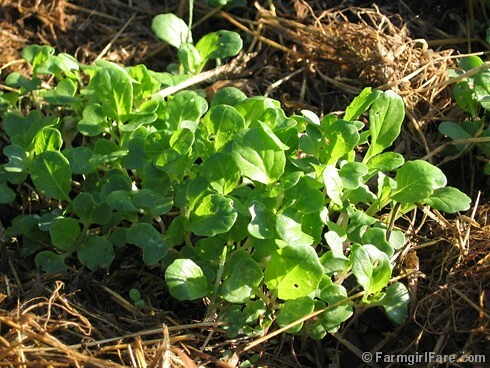 Another benefit to this scatter-and-cover planting method is that your seedlings should come in thick enough to smother out potential weeds. Any stray weeds that do sprout up can be easily plucked out. You also get to start enjoying your bounty sooner. Start thinning out your plants once they're large enough to eat; small leaves can go into salads, and things like baby bok choy are actually high dollar, gourmet delicacies. As you thin, the remaining plants will grow into the spaces you left. Keep doing this, and you'll have a continuous, weedless harvest. I probably won't do any fertilizing since there's already all that sheep manure in the bed, but compost tea and manure tea make almost all plants happy. It's best to water the tea straight onto the leaves; just remember to rinse them well before eating! Pest shouldn't be a problem as we move into fall and temperatures begin to drop. Cool, wet weather may bring out some cabbage worms and other voracious, soft-bodied nibblers, but a heavy sprinkling of food grade diatomaceous earth should take care of them. We buy this amazing stuff—which is 100% natural, organic, and safe—in 50-pound bags and use it all over the farm and garden, including feeding it to the animals—and even ourselves. Learn more about the many many ways we use food grade diatomaceous earth in Garden Journal 8/1/11: Attack! Using Organic Diatomaceous Earth on Blister Beetles and Other Pests in the Garden and Around the House and Farm. 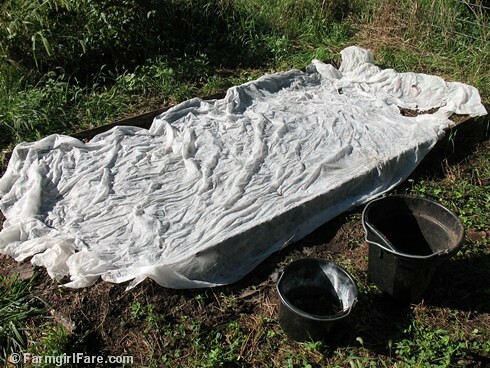 Once frosty nights arrive, you can protect your plants by covering them with an old blanket or bedsheet. You can use metal or plastic hoops, short bamboo stakes, etc. to keep the cover from touching the leaves, but it's not absolutely necessary. Sometimes I lay a piece of clear heavy plastic directly over the beds, but you don't want to do this during really hard freezes, and you need to remember to remove it as soon as the sun comes out or you risk frying your plants (been there, done that). 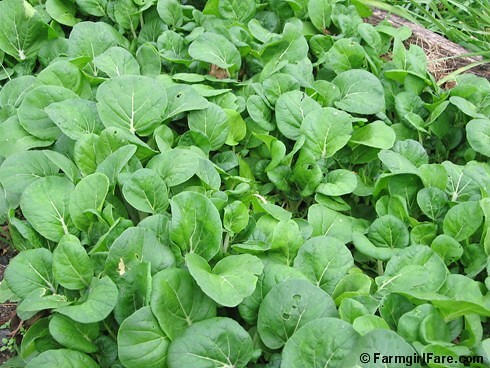 There are lots of other easy to grow greens you can plant now for a fall crop, and I'm hoping to write about some of them soon. In the meantime, have you ever grown Asian greens? Got some good recipes? Have you planted anything for autumn—or winter—yet? How's it going? Any tips, tricks, favorite things to grow, helpful advice (or warnings) to share? If you've writeen about any of these things on your own blog, you're welcome to include a link to your post(s) in your comment. © 2010 FarmgirlFare.com, the ready to get up out of this chair and head back outside to play in the dirt before it gets dark foodie farm blog where for some reason it seems to take a whole lot longer to write about doing things in the garden than it does to actually do them, which I suppose is probably a good thing, or I'd never have time to tell you any of this stuff—because if I had to choose between eating and writing, well. . . Try that Tatsoi in chicken salad. Super good! I love Asian greens. These look awesome. I think this year we will not be planting as much stuff for fall, because what I REALLY need to do is mulch the hell out of the garden to smother all the weeds that will no doubt come back to haunt me next year. And for that I need a blank slate. So the parsnips, leeks, and garlic will be hanging around, but I think that's it this year. Happy to know that there are many things we can grow in Fall. I live in Seattle. Didn't have a great summer this year, so couldn't harvest anything. On Sunday (Sept 12th) I planted beets, cabbage and spinach for fall harvest hoping that I will get something from my garden. Your post for fall gardening is encouraging. Keeping my fingers crossed for my fall veggie garden. Looks lovely! I sowed spinach in between my tomato cages, which are all but gone. My neighbors and I all garden, and we experienced the same problem with tomatoes you had (eastern KS area) Also, major crabgrass infestation this year ruined lots. One of my neighbors tried putting preemergent down in the fall, but this prevented them from having any crops until July. What's the best way to keep down crabgrass? My spring/summer garden did not produce well this year, so you have encouraged me to get out there and plant some things for fall. I usually plant spinach, china choy cabbage, and chard. Well, my midsummer sowing of asian greens were pulled a week ago--they weren't doing well due to pests and inadequate water. I was going to give up but you inspired me to try a Sept sowing. Thank you. Question regarding watering in seeds: does anyone water the soil first, then sow and cover with drier soil? I, too, am always thrilled to see my seeds sprout, even if they're doing it in the compost bin. I just saw your post about Asian greens, and have to heartily agree with what you wrote. I've grown a couple Asian greens - primarily mustard greens and bok choy, along with Asian cabbages - here in the Baltimore area the last two years. It's so much easier and less hectic than the summer crops, and so welcome. I've started them in the fall - I try August, but it's so hot that the germination rate is low, so September works better - and keep them alive over winter under cold tunnels with clear plastic as covers. This year, I also added row covers as an additional layer, although I'm not sure they were needed. The plants have been producing throughout the winter, and now that the days are getting longer, I can tell I'll soon have more than I know what to do with. It's wonderful having fresh greens in the middle of winter. I've also overwintered some spinach, lettuce and carrots, and I'm having a lot of fun seeing what works. One thing I learned about beets - I planted them in September too, and they didn't have much chance to start forming roots. If I recall correctly from last year, once spring comes, they'll start producing a seed head, rather than putting energy into the beet. I think the latest you can plant beets to overwinter is August.